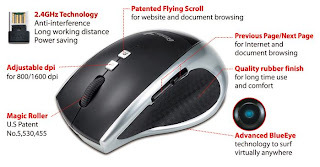 Genius Mouse DX-BlueEye ECO is the world’s first wireless mouse without batteries for PC & Mac users. No battery? Yes, the secret is the use the of the built-in capacitor (gold capacitor) that replace the battery and can be used up to 100,000 times refill. According to Genius, all we need simply refill it for 3 minutes then the mouse can be used for a full day. With Genius Mouse DX-BlueEye ECO, it means we do not need extra money to purchase external battery pack and also preserve the environment. Genius Mouse DX-BlueEye ECO is using a frequency of 2.4 GHz and can be used within a maximum distance of 15 m and have a 800/1600 dpi. it will be sold with price of $ 39.99.